Whatever the number is that NYRA reports as the paid attendance for Sunday, you can cut it by a third. The crowd was big, but the count was inflated by thousands of people who paid their way into the track more than once and left before the races began. 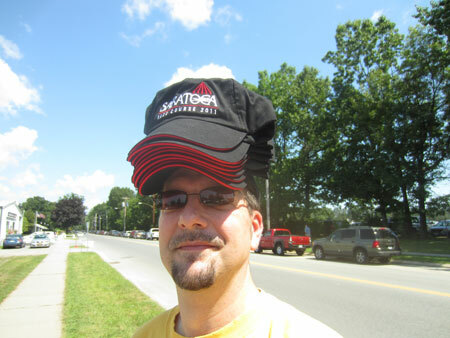 With every paid admission of $3, patrons received a coupon for a great-looking black ball cap with the Saratoga logo and date on the dome. Sixty minutes before the first race, there were more people going than coming. Caption: "Dean Divis, a Saratogian who hails from Lincoln, NE, knows, at least, that there's gold in them 'thar caps." Charlie Zast of Queens, NY, who will turn three on Monday, kept his unblemished streak of celebrating each of his birthdays at the races. He feasted on a sandwich from Spring Street Deli and Nana’s potato salad, blew the candles out on a strawberry cake, watched the action from a picnic table within steps of the horse path, opened dozens of gifts (his favorite was a pair of binoculars) and had Sam the Bugler drop by to squeeze “Happy Birthday” out of a trumpet. Caption: "Sam the Bugler plays Happy Birthday for Charlie Zast, age 3, of Queens, NY, in the backyard." 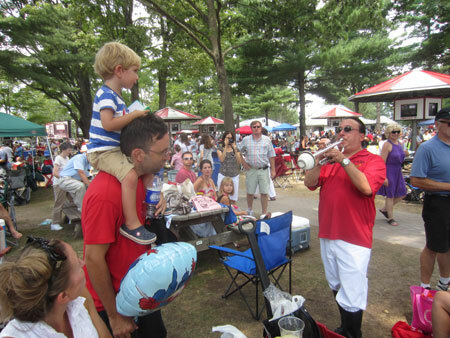 Unlike Charlie, most readers of The Blood-Horse wouldn’t think of attending the races without a reserved clubhouse seat or a table in the dining room. But many horse racing fans in the backyard find the formality stifling. For example, John Mooney of Saratoga Springs, NY, who for 30 years has been a regular, says the crowd is a “sea of anonymity.” He likes the cool natural air and the company of eight to ten neighbors – friends that take betting seriously. “I’ve been to 119 racetracks in 14 countries,” said John Pittman, as proof of his authenticity. “They’ve got the sheets and they’re doing it all,” he said about the men with whom he hangs out. Fortune Hunter, an alias for Albert Levi, worked a computer on his picnic table to access the subscription-based tip service he produces. “The per capita wagering back here might be a little lower because of all the distractions,” Levi admitted. “It’s a picnic with something to do,” he acknowledged. There’s a procedure for reserving a prime spot. You send an advance man with some table cloths to the track for the morning workouts. He covers the tables and that’s that. When you and he return an hour before post time the tables are waiting. It’s a method that works. NYRA gave up on trying to sell reservations. Remember that? Darn, if there weren’t some close finishes. Marquet Rebel and Stud Muffin dead-heated to open the card. Hyper nosed out Versailles Road in the sixth. A race later, Never Right Joey and Fiery Rebel finished the same margin apart. Bobby Flay’s Super Espresso looked to be menacing briefly in the $250,000 gr. 1 Ruffian Handicap. But she was trounced by an 18-1 shot. The celebrity chef looked smart in a pin-striped suit and exceptionally skinny when seen at the Mike’s Hard Lemonade stand. 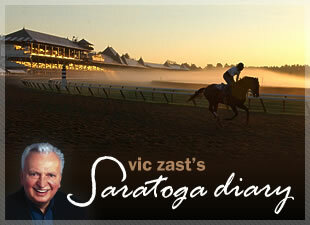 Vic Zast is the author of “The History and Art of 25 Travers.” He’s been to the races in Saratoga for 48 straight seasons.